At the risk of over exposure, I'm posting yet another card with that lovely window die cut! You can't predict which way card inspiration will go, so I just tend to go with the flow. 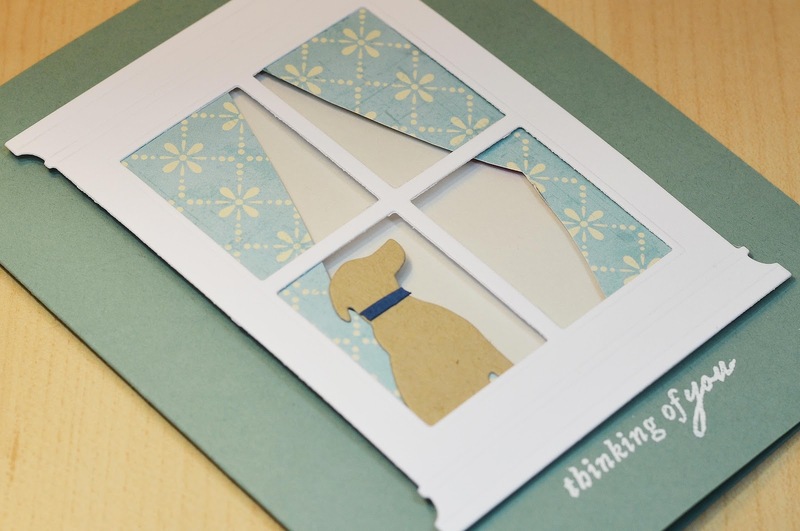 This card was inspired by our crazy puppy Cooper (see his picture in the side bar to the right). Most evenings when my husband comes home from work this is the scene in our front window. I have bought this die on the strength of your gorgeous cards...especially the chest of draws!!! Such an inspired idea. Love the gorgeous curtains, and the super sweet pup waiting in the window! Is that Cooper in the window? Another fab idea for this die! Love it! Love this card. Nothing cuter than a dog sitting in the window waiting for the family to come home. I'm really enjoying all your clever uses for that window die. Aww, bless!! This is so so sweet! You should get commission from sales of this die with the way you're rocking it!